Pissed Off: What's Wrong With This Principal? Everyone knows that schools do better with experienced staff. Even a teacher with only three years under her belt will do better than a newbie straight from college. And, even experienced teachers transferring in need a bit of time to learn the procedures of a different school. So now I'm starting to wonder what is wrong with one particular Principal. The school is in a great neighborhood with easy parking and access to public transportation. The students are relatively good, no gang violence or any real problems of any kind. Heck, there is even a great teacher's cafeteria, something very few schools have now a days but teachers are still leaving in groves. I've heard that 10 teachers (I might be wrong on the exact number) walked out of one department this year, a department with very needy students. Now I am not around but I am guessing that 10 teachers from one department can only mean there is something wrong with the supervisor. Does this person know how to be a supervisor? How does this AP do when it comes to training and helping teachers? Can the AP deal successfully with problems that arise? Does the AP treat all teachers fairly and equally? I've heard stories (count them as stories as I am not giving any proof) of shenanigans with grades and credit recovery and with regents proctors who supply answers during exams. Can it be the teachers don't want to participate in this cheating scheme? Now back to the title of this post. Shouldn't a Principal notice something is wrong when so many teachers walk out the door year after year? Or, maybe the Principal doesn't care. Maybe this Principal approves of this behavior. After all, the school's statistics are still good and the school is still one of the highest rated in the city. There's been a fundamental shift in the paradigm of a supervisor since The Bloomberg Years. (Yes, it is an era - like the Dark Ages.) Before that dreaded time supervisors were trained to be facilitators of teachers, students, and schools. Now they are trained like fast food managers- maximize profits (stats), work the staff as hard as possible, pay them as little as possible and when they make too much money get rid of them (and start all over). High turnover is par for the course. I'm sure that principal couldn't care less. 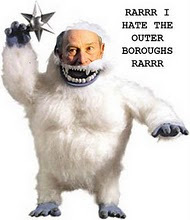 Farina should put an end to Bloomberg's legacy. This Principal has kids and one who would be in the program if this was the Principal's home district. The Principal came through the ranks and pretends to care about kids. What a farce this administrator is. I too work in a great school building. The administrators make us all miserable. Our new teachers don't stay beyond 3 years and the ones that can retire retire! Not one of these teachers will say the real reason they are leaving. Administrators. Boy, Bronx ATR is right on the money. Schools are being run like businesses. I've seen the same thing happen with churches. Huge mistake on both.